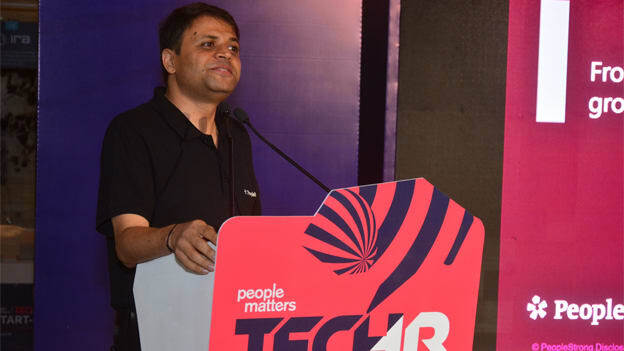 In his masterclass for startups on day three of Tech HR 2018, HR industry leader and founder of PeopleStrong, Pankaj Bansal, demystified the sales process for HR tech startups and shed light on what they should focus on to set up a robust sales process in place with the least investment. Startups need to focus on building a demand-gen function. If you are an HR tech startup in the initial stage in India, you are well versed with the challenges that come along while selling in a competitive space. With so many vendors targeting the same community of HR professionals, HR tech startups face immense competition in landing customers and building a continuous stream of revenue. So what are the dos and don’ts startups need to focus on to crack the sales conundrum? In his masterclass for startups, HR industry leader and founder of PeopleStrong, Pankaj Bansal, demystified the sales process for HR tech startups and shed light on what they should focus on to set up a robust sales process in place with the least investment. Here are some key insights on selling an HR tech product from the session. When you start on sales, you think of selling more and taking over the world. You think of going strong on your gravitas, on your personal contacts, but once they are exhausted, you are back to the grind. So this personal cowboy approach to sales only goes that far. It’s fine if you start like this, but the sooner you move to the other part - which is people sell to people, getting go-getters in sales-way is better. Then you realize there is a well-oiled engine you need for sales. Startups should be ready to spend money to get an expert who can design a sales process for them. Because though founders may feel they are good at sales - but they are not. Citing an example of his own firm, Pankaj revealed how PeopleStrong created a demand-gen function. It started to look at SaaS-based companies like Capillary Technologies, Freshworks, which are able to sell without being face to face. They do this by defining the sales process. All of them have a function called the Chief Revenue Officer. They have a sales team and a revenue team. Startups need to focus on the demand-gen function and not rely on databases because typically any Indian HR database would only yield around 3K-4K leads. If a startup has a good sales engine, it would be able to exhaust this data in 3-4 months. So what to do next? Here is where the concept of BANT comes in - Budget, Authority, Need, Timeline. One cannot crack all the 4K leads in one go - a better way to go about is creating campaigns of say 200 leads. Every call made to this database is classified on the basis of these four parameters. So if 70% of the leads are converted, 30% of data can be used later. In their early stages, startups need rockstar salesmen and deploy this demand-gen function. When it comes to processes, Indian startups need to deploy a CRM in early stages to set the sales process. They can opt for an open source CRM even in early stages. Every single data point needs to go into the CRM. This makes data transparent for everyone, and everyone on the team has visibility on it. Thus the direction of growth is no more a dark alley, bringing about predictability in the system. Startups also need to remember the sales guy is not supposed to do solutioning. He is supposed to sell the product and not solution the customer. Either you can sell what you make or make what you sell. As long as a startup makes what customers want, it will remain a services company as opposed to becoming a product company. A product company sells what it makes. Thus the next investment the startup needs to make in is in a solutioning expert. He is an HR expert or subject expert who creates a solution and gives it to the sales guy and the finance team to create a pricing sheet. Price sheet should not be controlled by the sales guy, his job is to go and sell what he is told. Startups need to remember there are four stakeholders in the negotiation process. The CEO and the CHRO are the first two ones-and if a startup is not able to reach them, they are missing something. The third stakeholder is the HR stakeholder. The fourth third stakeholder is the invisible figure whose 'yes' may not matter that much but if they say 'no', it matters a lot. For instance, the CTO or the CIO of the company. It is these four stakeholders who yes or no will matter for closing the sale. For closure, startups can also create artificial timelines for the customer to commit. The key takeaway from Pankaj’s session was that startups need to get professional salesmen from outside on board and focus on building a demand-gen function. Professional sales people have been there and done that- so there is no need for the HR tech startup founders to reinvent the cycle of sales. There is no need for the HR tech startup founders to reinvent the cycle of sales.